On 21 December, the city of Madrid once again marks the winter solstice with its Fiesta de la Luz (Festival of Light) parade. The concept, which has long been popular in Scandinavian and other countries in the north of Europe, started in 2016 as a way to bring light and colour to the shortest, darkest day of the year, and once more the Jardines del Puente de Toledo are the setting for the celebration. Lanterns are the star of this particular show – those watching are encouraged to bring their own to help light up the park (although sky lanterns are not permitted for safety reasons) – and some of them take on surprising, innovative forms. 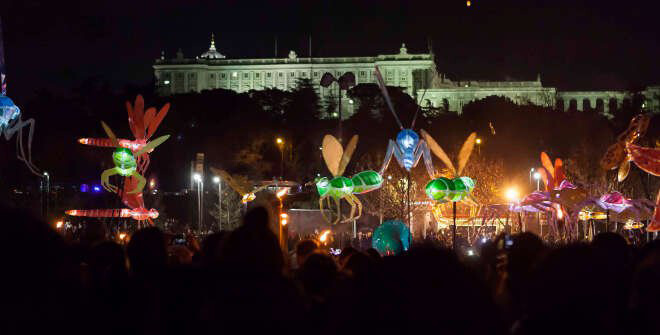 Two marching bands also perform as part of the parade, and they’re followed by a grand firework display at the Puente de Toledo courtesy of the Pirotecnica Volcano company, which has live accompanying music created for the occasion by Spanish composer Luis Miguel Cobo.